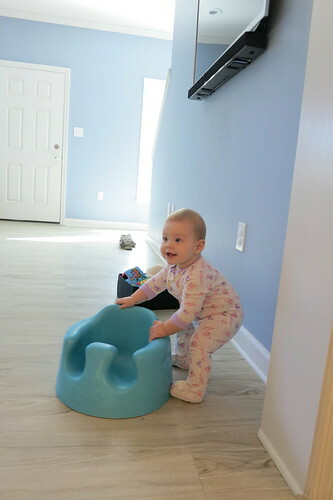 This week Audra continued to get more mobile, and it's so cool to see the whole process she's going through to learn to stand and get around more. 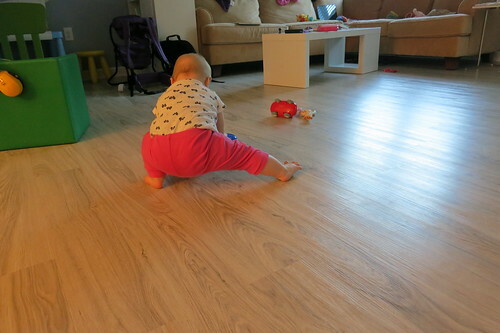 She got a little quicker with crawling now, although she does still get upset if she has to go too far or if she can't keep up with us as we move away from her. 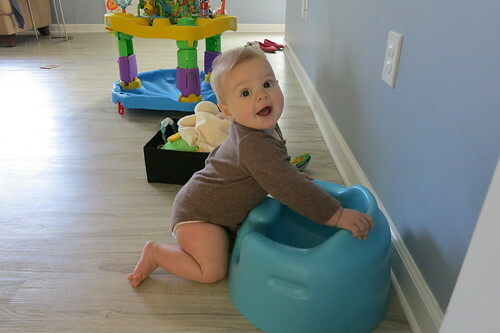 She also sometimes gets too excited to crawl (usually because of Josie! ), so then she ends up slipping all over the place and doesn't actually get anywhere ;) But I've quickly realized one of my favorite things is when she seeks me out, crawls right up to me, and then starts pulling on my leg (if I'm standing) or crawls onto my lap and starts slapping my leg (if I'm sitting). I think she's starting to get a lot more interactive now and it's so fun to see what interests her... including the stairs(!). 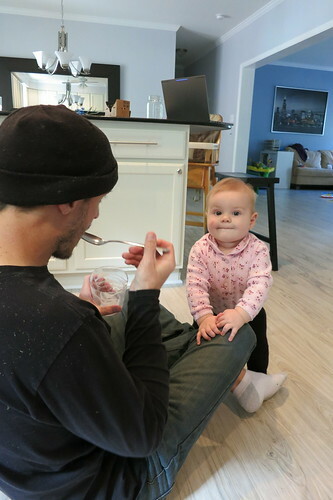 Audra also got a tiny bit easier in some ways this week, since she's starting to be able to entertain herself on her own for a remarkably long time, including once when she was happy playing around my feet as I worked in the kitchen for almost an hour. She is also doing a bit better in the evenings, still crying on the drive home but not as frequently, and taking a nap while on a walk with Ryan is helping us all have more family time together, since she's usually pretty content for a while after that and we're no longer immediately rushing to get her to bed before she melts down. Which is especially good, since she did not tolerate me sneaking out at all this week after she fell asleep (waking up screaming within minutes each time), so at least if she's going to bed later, then it's not so ridiculous for me to go to bed the same time as her (6:30pm - ridiculous, 8pm - not so much!). One of the issues with Audra waking back up when I sneak out is she's quite quick at getting herself into trouble. She wakes up, realizes I'm not there, then almost immediately gets up to go find me - and it would be a tiny bit funny that she's so determined to find me that she doesn't even have her eyes all the way open yet as she's crawling around, except for the fact that she fell off the bed. Again. And this time, she somehow completely missed all the padding I had put on the floor and possibly landed on her head (at least it was only off the futon, which is lower than our bed, but still). So now there is a bed rail along the foot of the bed too, with the only remaining gap filled by a husband (the pillow, not Ryan). Speaking of Ryan, he helpfully pointed out that I have recreated a crib for her, only I'm now sleeping in it too. Yay.